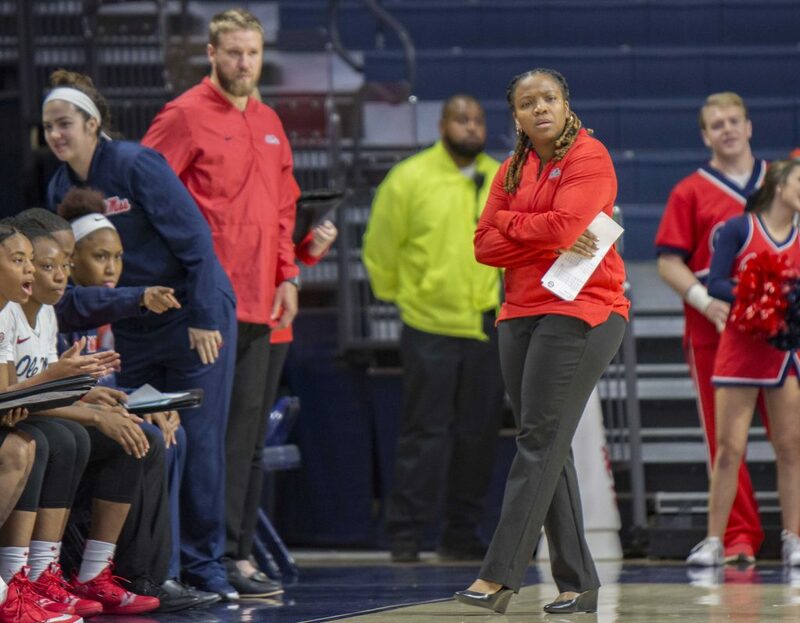 Coach Yolett McPhee-McCuin, affectionately known as Coach Yo, plans on bringing her intense work ethic with her as the ninth head coach of Ole Miss Women’s Basketball. The role model, mother, wife, daughter and new Rebel head coach has been on this mission for a while now. Coach Yo began her career 13 years ago at a small school named Frank Phillips College in Borger, Texas. On her journey to Ole Miss, she held numerous coaching positions, working as an assistant coach for Arkansas Pine-Bluff, Portland, Pittsburgh and Clemson before becoming the head coach at Jacksonville University. However, she said her coaching dream finally came true when she got the offer from Ole Miss. The veteran coach said the culture at Ole Miss has been the greatest part of her move from Jacksonville to Oxford, making the transition almost seamless. Coach Yo believes she has grown exponentially since her first coaching gig at Frank Phillips College back in 2005. After all of her different stops, Coach Yo said she is ready to take on the challenge of being a head coach at the Division I level. Along with coaching at the college level, Coach Yo also coaches for the Bahamian National Team, giving her invaluable experience she can bring to Oxford, which will come in handy as she adjusts to coaching in the SEC against coaches she once looked up to. This year, the team is full of new players, and Coach Yo said she is excited to have a new team that gets along. She said great personalities will make chemistry building that much easier for her and the new staff. Her main goal in Oxford is to see the women compete, and that starts with assembling a good staff that will take the team to the next level. Rebels fans may be familiar with one member of her coaching staff — Armintie Price, former Rebel great and 3rd overall selection in the 2007 WNBA Draft. Coach Yo may not need to win the conference each year now that she’s coaching in the SEC, but she understands that doesn’t mean there is room to slack off, attributing the team’s overall attitude to its level of success. “When you see (the team) on the floor, they are going to look like they want to be there,” Coach Yo said. “They will give 100 percent,” Coach Yo said. To meet her standards, Coach Yo pushes her team with tough drills to make sure they can be the best possible versions of themselves every day. With nine newcomers on the team coinciding with Coach Yo’s arrival, the 2018-19 season will be a challenge for the Rebels. However, she isn’t concerned with immediate results this year, instead focusing on shorter, more manageable goals and building a culture.